Steven Butala: Welcome to the Land Academy show, entetaining land investment talk. I’m Steven Jack Butala. Jill DeWit: And, I’m Jill DeWit broadcasting from a sunny southern California. Steven Butala: Today Jill and I talk about location, location, location. All week this week we’re going to talk about true real estate cliches. Jill DeWit: Some are good. Steven Butala: And, next week we’re going to talk about ones that are ridiculous. Jill DeWit: So, true meaning they are real estate cliches and there’s ones that we do believe in. Steven Butala: Yes, and there worth. You need to know about them. And, if you already know about them you need to think about it once again and maybe laugh about it a little bit with us. Steven Butala: Before we get into it let’s take a question posted by one of our members. 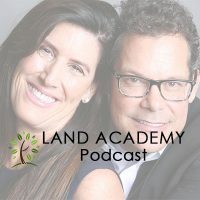 On a LandInvestors.com online community it’s free and as you’re listening to us or really probably watching us drop your questions below into the comments section on YouTube. Jill DeWit: Cool. Joe asks about a 1.29 acre property and found out there is an illegal septic system on the property and the county is requiring that it be disposed of before anyone builds on it. “I had a guy about to buy it but he somehow discovered this by calling the county after he had already signed a purchase agreement and closing was held up for two months due to a title company error.” Goodness, “No on at the county or township informed me of this problem when I called. Of course, the person that sold it to me didn’t tell me probably because they just wanted to dump the problem on someone else. What would you all do in a situation like this?” I know what I’d do. Steven Butala: What would you do? Jill DeWit: Write it off. Steven Butala: Well, [inaudible 00:01:40] and it’s expensive. Jill DeWit: Or, unload it. I would be very of course up front, and honest, and transparent about it and I would have the price adjusted to make it a good … How do I say this? Because of the problem I would have it reflected in the price and sadly it bums me out that the person who did this to him. I don’t know if I would say, here’s my thing. Do I want to go back and fight it with that person? Steven Butala: Well, hold on a second. Let’s take a couple of steps back. Jill DeWit: Alright. I’m getting all into it now. Steven Butala: This is not the norm. Steven Butala: I intentionally left this question in here. Steven Butala: Our producer chose this question and we all know Joe. Steven Butala: And, he’s a super good guy and he’s going to do the right thing but and you have a choice. This is very rare that this happens, very, very, very rarely. Steven Butala: And, maybe not often enough that celebratory questions and stuff don’t happen through this venue but it happened. Steven Butala: And, it happens once in a while. So, you can throw the legal book at this person. Steven Butala: And, say they didn’t disclose it. Or, you can fight it and spend a bunch of time, or you can solve the problem. Steven Butala: And, I would solve the problem. I don’t think that removing a septic system is very expensive at all. You dig a hole in the ground and you take some stuff out. And, I may be over simplifying, I don’t know. I don’t think I would pass this on to the new person and adjust the price. Jill DeWit: You don’t think so? Steven Butala: No, because I know where Joe’s, I know where he’s buying and selling real estate and he doesn’t need that reputation in that market. Jill DeWit: Well, here’s what I would do. Here’s another idea ’cause I’ve done things like this. I can do X, but I’m going to charge Y or I can give you all the information. I’ve got a company lined up. I know it cost X amount of dollars. Here’s the guy’s name. Here’s what’s involved in it. I’ve done all the work and … ‘Cause I don’t want to hang on to the property for the month that it’s going to take to do this and maybe somebody else is going to love it and so. Steven Butala: It’s hard to answer these questions. If there’s 150 thousand a spread of margin and it’s going to cost 25 grand and an extra month to fix this and clean it up. Jill DeWit: Oh, that’s true, then I might do it. Steven Butala: Right. So, it’s just hard to answer it. Steven Butala: And, I’m not saying, I didn’t say Joe’s asking the question wrong at all. It’s just tough sometimes for Jill and I to answer questions with half or one 10th of one percent of the information. Jill DeWit: If I’m going to make a 100 thousand and it costs 20 thousand to move it no brainer I’m going to do it and make it perfect. Steven Butala: Yeah me too. Jill DeWit: And then, we can get it done. That’s fine, that’s true. If it’s five thousand dollars for the property and a thousand dollars to move this I might just say, “Hey it’ll cost you a thousand bucks. That’s why it’s priced at five, it’s worth 20”, or whatever it is. Steven Butala: We’re working on a website called InfillReport.com with a guy who works for LA County as our business partner and this would have smoked that out. Jill DeWit: It would’ve saved him. Steven Butala: On the acquisition side. Steven Butala: And, it’s slated to be released before the end of the year. Steven Butala: So, hopefully that, and it’s just because of situations like this. Jill DeWit: That’s awesome yeah. Steven Butala: Today’s topic, location, location, location. This is the meet of the show. What does that really mean? When you hear that? Do you remember the first time somebody ever said, “Oh it’s location, location, location”? Jill DeWit: Yeah. It was in a conference, I don’t remember exactly the first time but I can tell you the sentiment. It was talking about, God why does it cost so much to be here kind of thing. And, we’re like, “You know location, location, location”. And, that comes from growing up in southern California because I remember learning why is this so expensive where we live. And then, where all my relatives and my cousins are in Michigan. I don’t get it kind of thing. And then, it was like oh now I get it. That was when I first kind of heard it and understood it. What was it for you? Steven Butala: You know I hear that, I hear location, location, location. The first time I heard it was from a really old neighbor in Michigan, the guy was 180 years old, explaining why something was so expensive. And so, my first gut reaction was, first of all why do you have to explain whty a piece of real estate is so expensive? Steven Butala: That was my, and I was like 15 years old. Jill DeWit: It’s sunny 320 days out of the year or something like that. Steven Butala: Yeah, so every time you ever hear location, location, location, ever since then I always have kind of chuckled to myself ’cause it’s like well … It comes out of over zealous real estate agent’s mouths. Steven Butala: What if I? How can you justify? It’s 15, [inaudible 00:06:22]. And southern California’s 15 million dollars, no it was 16 million which ends up being almost $3000 a square foot. And, you know I could, I would just wait for it, wait for it, well location, location, location. “This is the most unique piece of property in the world.” That’s just what this agent said to us. “There isn’t anything like it, anything.” And Jill and I were just looking at the guy with our jaws on the ground going, “You have no idea who you’re talking to”. Jill DeWit: Right, that’s funny every time we do that, I’m with an agent. We don’t really talk. We usually use the data, where the data had or something and it’s funny. I love to hear what they’re going to come out and say. Jill DeWit: But, it could be. Steven Butala: Location, location, location is in my opinion a true cliché but it’s also relative. If you have two pieces of property that have pretty much the same attributes, the same location, let’s not kid ourselves. It’s pretty darn close, they’re pretty similar. And, there’s such a price variance then you have to ask yourself can you justify that for, use that cliché to justify price? Jill DeWit: I wrote a couple of notes. So, here’s what, before we did this show and I was just kind of taking a step back and thinking what does this mean to me as I often do. “What does this mean to me? What do you mean to me?” Just kidding. Steven Butala: We’ll get to that in a minute ’cause I’d like to hear that. Jill DeWit: So, I was thinking okay what does this mean to me. And, I’m thinking well number one when I hear location, location, location, well duh look at us. It’s no secret that where we live and our lifestyle is because we want to be at the beach, like darn near on the beach where you can ride your bike, have a boat nearby, and the weather’s gorgeous, it’s safe for children to play in the front of the house, all of those things, and we are willing to pay for it. Alright so, check. The second thing I thought about is everybody else and I’m like you know it’s interesting looking at all my neighbors and everyone around us and heck all of southern California, it’s clearly a mindset and there are a lot of people that see the value in that and are willing to pay for it as well. So, I don’t feel crazy. So, some of that location, location, location, it’s not like my house is this amount house and the money next door, we all have that mindset so it all kind of plays into that too. And then, the third thing I thought, when you’re looking at this and you’re like oh gosh. People who come out here and they look at us like we’re bonkers ’cause of how much we spend, and where we live, and the lifestyle, but the data kind of backs us up. You know I hate to say it. Steven Butala: “The data backs us up”, that’s what she said. Steven Butala: I don’t know why every time Jill talks about data she goes like this, “The data backs it up”. Jill DeWit: Alright, alright, alright. I love data. I love it, I love it, I love it. You know what I still have? I started to make T-shirts awhile back and I’m going to follow up on that, Data Is The New Bacon, I’m going to do that. I had that whole thing going for awhile. But anyway, the data does back it up. You just said, you just threw out these crazy three thousand dollar per square foot comps, that number I should say. Well guess what? There are comps next door for three thousand five hundred and there’s a comp for forty two hundred dollars a square foot. And then, you know twenty nine hundred dollars a square foot. So, this location, location, location, it’s real you’re right it’s true. Steven Butala: Yeah, it’s real, it is. It’s real and it’s not just three thousand dollars a square foot for housing, right? I’m talking about, let’s get back to land for a second. What’s a ranch worth in the middle of Montana? Now you’re talking about four or five thousand dollars an acre max, maybe a lot less than that. And then, you put that against another ranch that’s 25, 30 miles down the road that’s got some different attributes and it’s $500 an acre. What’s the deal there? Well, chances are there’s a location or an attribute situation that’s with the other one to justify the price or maybe there’s not. That’s the business that we’re in so our business is finding the gems based on not the actual asset itself. Here’s why this all works, let me tie this all together. Here’s why this all works. Because it’s not so much the location or the asset itself that’s valuable here, it’s the situation that the seller’s in when they open up your letter and see how much you’re willing to pay and how fast they can get out of it. So, location, location, location is on the true side, the good side of real estate cliche’s cause you can make it work for yourself. Steven Butala: We call it an attribute, we call it access, we call it the four A’s, some version of that. Steven Butala: If you don’t know what the four A’s are, please go to the website, our website, or one of them, usually probably Land Investors and just it all up because I’m tired of talking about it quite honestly. Jill DeWit: It’s alright, I’ll cover it. I covered it on my show. I talked about it the other day. Steven Butala: So, let me play devil’s advocate. Steven Butala: Or, do you have something to say here? Jill DeWit: No, no, I have nothing to say. Steven Butala: Everything you just described about the [inaudible 00:11:49] community that we live in and justify how expensive it is, if you go 20, or 30, or 40 miles up the beach north or south, the same exact attributes that Jill described but half the price. Steven Butala: So, how do you justify that? Jill DeWit: South is weird. It’s location again. Steven Butala: But, it’s half the price. Jill DeWit: Yeah, well okay. Steven Butala: But, you still have all the things you just listed. I’m respectfully putting you on the spot here because I really actually personally want to know the answer to this. Jill DeWit: Well, you know the answer. Steven Butala: I’m going to name names. If you go to Santa Barbara. Jill DeWit: It is cheaper. Steven Butala: It’s half. If you go to Orange County it’s probably 75% of what it costs here. Is it better or worse? Jill DeWit: Well, for us I think it’s better. I like, but anyway, alright. So, Orange County gets worse, there are parts of Orange County that are worse than here. Steven Butala: What do you mean worse? Jill DeWit: 48 million dollars. Steven Butala: Oh, more expensive? Steven Butala: This is what I’m saying, these urban legends. Jill DeWit: What was it? What was he offered again? Steven Butala: It’s all a bunch of crap. Jill DeWit: A 100 million, that’s it, he was offered a 100 million. Steven Butala: It’s real estate agent BS milarky. Jill DeWit: That’s true, I know. He’s just making it up. I’m sure. Okay, so back to the question. Are you asking the question or are you done? Steven Butala: Yeah, no, no, I totally want to know. All of the attributes you just listed. If you go to Santa Barbara, north of Los Angeles, or you go to Orange County south of Los Angeles the prices are very very much more attractive for us. Jill DeWit: I would argue it’s a different attribute that’s changing the price. For example, location to Los Angeles, there’s a definite difference. Jill DeWit: There is no strand, definite difference. It’s a smaller community, definite difference. School system, definite difference. Steven Butala: You got me there. Jill DeWit: So, you want me to keep going? Steven Butala: I forget this all the time. We can live wherever we want literally, if we have an internet connection or it’s not going to effect our financial outcome at all, in fact it may enhance it. It will enhance it if it’s cheaper. Steven Butala: So, not everybody’s like that. There are a lot of people that have jobs, most people have a job and there’s a lot of, Los Angeles is the second largest city in the world. So, people who do well financially they have to live here, that’s what’s driving the price up. Steven Butala: Their lack of mobility. Jill DeWit: That’s very true, we aren’t trapped, we aren’t stuck. Steven Butala: I’ll leave it at that. Steven Butala: Well, you did it again. You spent another 15 minutes with us listening to the Land Academy show. Join us next time where we discuss the worst property on the best street. 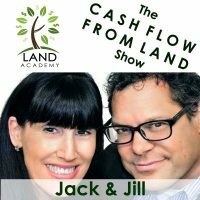 Jill DeWit: And, we answer your questions posted on our online community LandInvestors.com, it’s free. Steven Butala: You are not alone in your real estate ambition. This is fun. These cliches. Steven Butala: I don’t mean to be argumentative with you but it’s just devil’s advocate situation like I want to, these cliches, the stuff I’ve been hearing. At our age when we walk into a house or into a real estate deal, I can tell you what these agents are going to say already and it’s all some version of these cliches. It’s so funny. Jill DeWit: Isn’t it hilarious? I know it’s kinda … Maybe you know what I think? I’m so numb to it now I don’t even hear ’em. So, some of the things that you were telling me later. “Could you believe what that guy said?” I’m like, “You know what I didn’t even hear it.” I know what he thinks. I know who he thinks he’s talking to, that’s not who we are at all. I’m here to look at the asset and get out. I don’t need to hear that, that’s kind of funny. Steven Butala: You’ve always been better at letting things roll of your back. Steven Butala: Letting, what is it? Yeah. Jill DeWit: Water roll off a ducks back? Jill DeWit: Thank you. I appreciate that. Hey, since I have a minute I would like to plug a few things if you don’t mind. Jill DeWit: One, is if you haven’t seen it please check it out. I am every Wednesday at 2 o’clock Pacific time on Facebook Live. Ask me anything you want, it’s Getting Started With Land academy and I’d love to have you join in, and it’s recorded so you can watch it later on Facebook if you go to the Land Academy Facebook page. The other thing I’d like to say is we have a special ending on Halloween, so for details go check it out at LandAcademy.com. Jill DeWit: Thank you. Share the fun by subscribing now by hitting the subscribe button to stay up to date on our podcasts or if you are new to our channel. And then, if you’re watching on YouTube please like us and comment what you would like to see in future shows. And, while you’re at it please rate us there. Jill DeWit: We are Steven and Jill.